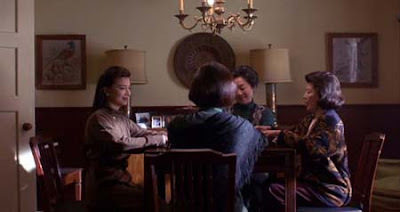 Last night I re-watched the movie The Joy Luck Club thanks to TCM, and a few things stuck out at me as I haven't seen it in forever since I was younger. 1. That movie is way old now. 2. Maybe I'm just a cream puff at heart but I couldn't help but breakdown like the blithering idiot I am, more than once going "That's just so..." - fill in big words like "sad", "great", "touching". 3. I know luminaries like Frank Chin couldn't stand the book or movie, but really - it was a good flick (see fiction) filled with some great flawed characters. And I love my flawed characters. 4. As an Asian American male I get it to a certain degree about the portrayals, but really, it just doesn't bother me. Maybe it's because I know it's fiction. Maybe because since then we've had so many representations of the Asian/Asian American male (although still lacking). I don't know - I'm kind of on a Mocha high right now so I'm rambling like a blithering idiot - but - it just doesn't bother me. Maybe I need to be more militant. 5. I really think I'm in touch with my sensitive side right now. 6. Sleep deprivation will do that, along with tons o' caffeine. 7. Just wanted to give a shout out to TCM for putting on some cool films. My favorite was the Anna May Wong retrospective Anna May Wong ~ Frosted Yellow Willows: Her Life, Times and Legend.